In 2016, the Minnesota Vikings football team moved its game-day turf to U.S. Bank Stadium. This move was the first step for increasing fan enjoyment and engagement. Next was replacing Winter Park, the team’s 15-acre headquarters and practice facility in Eden Prairie, Minnesota. For 37 years, the facility served them well, but the technology and training amenities had begun to deteriorate. It was time to not only upgrade its practice facility but to lead the charge with operational and technological capabilities offered by an NFL team. To that end, the Vikings moved into a brand-new, cutting-edge practice facility in early 2018. The Twin Cities Orthopedic Performance Center provides over 277,000 square feet of space, which includes administrative offices, five outdoor practice fields, an outdoor training area, an indoor practice facility, a team auditorium, a media center, locker rooms, and several specialized fitness zones. In addition, the center is designed to offer an incredible fan experience with a 6,500-seat practice stadium that will be used for training camp and other events. With the opening of the new center, the franchise endeavored to become the most advanced sports practice facility in the world. As part of that mission, video capabilities had to be at the forefront of every area. More than 300 displays of all sizes were installed, which would be responsible for delivering a wealth of content to the organization, including providing access to a broad range of TV channels, live camera feeds, as well as digital signage content. The digital signage alone would include workout schedules, nutritional information, human resources content, and more. With such multifaceted technical and operational requirements, the Vikings needed a centralized solution that would allow its administrators to manage, create, and distribute any video feed and enable on-demand access to TV channels within an easy-to-use, affordable system that would deliver the best performance and quality of streams. As a leader in video streaming solutions for the world’s most state-of-the-art sports and entertainment venues, VITEC was specified as the provider of choice even as the facility was in development. Utilizing the comprehensive architecture of the platform, the staff would be able to centrally manage and stream HD, low latency, in-house video feeds and cable channels as well as create eye-catching digital signage for distribution to all the venue’s displays and menu boards. VITEC’s IPTV and Digital Signage Solution for Sports Venues offers a cost-effective, flexible, and open architecture that is ideal for the ever-changing video, marketing, and sales requirements of today’s sports venues. It distributes live video content from various sources including cable, satellite, off-air TV channels, and locally generated private video. Utilizing VITEC’s hardware based IPTV and signage end-points, users benefit from low-latency playback, real-time updating of electronic program guide, video-on-demand (VOD), time-shifted TV, real-time analytics, and user-controlled mosaic viewing of multiple channels. All available streams can be mapped to create customizable channel lineups for different users and groups within the organization. 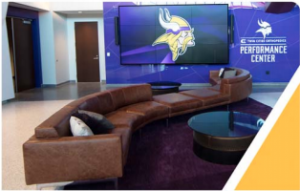 VITEC’s EZ TV IPTV and Digital Signage Platform provides the Minnesota Vikings with a professional, broadcast-grade IPTV and digital signage ecosystem that builds upon the team’s mission to offer cutting-edge services. The organization has full control of each video stream, allowing the Vikings to support its staff and players as well as enable a new fan experience during its practice games. With centralized creation, distribution, and monitoring of live and on-demand video content and digital signage, each display offers a unique experience that meets the requirements of the user and space. For example, teams can record any live stream and review it back, adding a sophisticated, in-depth layer to their practices. Players and staff can enjoy a professional TV experience, easily choosing live action footage, VOD movies, or game highlights via a user-friendly interface. When it comes to effectively managing satellite/cable TV content, VITEC’s approved AES content protection capability offered through the EZ TV Platform enabled the facility to quickly receive approvals from DirecTV for using the Com2000 IP gateway as a source for dozens of DirecTV channels. Streams from the Com2000 are processed in real-time by VITEC’s Ocaster DRM server and streamed fully encrypted from the server room to any desktop and physical end-point connected to a display. EZ TV’s field-proven and service-provider-approved end-to-end encryption architecture provides a major advantage for venues as they discuss IPTV distribution with their content providers.